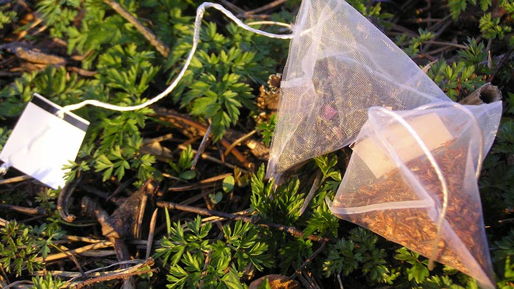 This is the 1st in a two part blog series on the citizen science project The Tea Bag Index. Soils contain a wealth of organisms. The food for many of those organisms is dead plants or other organic material. By consuming plant remains, they provide a vital function to the world, called decomposition. That is, soil organisms decompose organic material and make nutrients available for plants again. However, they cannot consume all organic material that is available, and globally about 2700 tons of carbon is stored in the soil, which is 2-3 times as much as in the atmosphere. Therefore, changes in decomposing activities of soil organisms will modulate the organic content of the soil. As the greenhouse gas carbon dioxide (CO2) is produced during decomposition, changes in decomposition may have large implications for the concentration of carbon dioxide in the atmosphere. Measuring decomposition is a quite laborious process, where you measure the weight loss of plant litter enclosed in plastic mesh bags placed in the soil. So after a long day in the lab, I did what every person would do after making hundreds of bags: I complained to my colleagues, and they agreed. However, while complaining we realized that the very teabag we were using to make tea at that moment was actually similar to a litter bag. Modelers in the group started to dream about obtaining enormous amounts of data using a unified, comparable method, with which they could model what could happen with the enormous amount of carbon in the soil under climate change. Although many decomposition studies have been carried out already, unfortunately, each research group choose their own method, making it now hard to compare data across studies. For example, how to filter out the effect of climate in decay curves obtained from litter incubated at 3 cm depth in Alaska to litter from another species buried 6 cm deep in South Africa? The Tea Bag Index we developed solves this problem with an extremely easy method. You take one green and one rooibos tea bag (everybody has to use the same brand). You weigh them, bury them 8 cm deep in the soil and after 3 months, you take them out, dry them and weigh them again. The weight loss will tell you how much and how fast plant material decomposes at the burial location. By using two types of tea we obtain two proxies that characterize two different phases of the decomposition process. During the first phase, all the easy material is consumed, while in the second phase, mass loss is much slower as only the more recalcitrant material is left. With the decay of easy to decompose green tea (green line) one can determine how much of the labile fraction of the material is decomposed and how much is stabilized, which is a proxy for the second phase of the decay model. 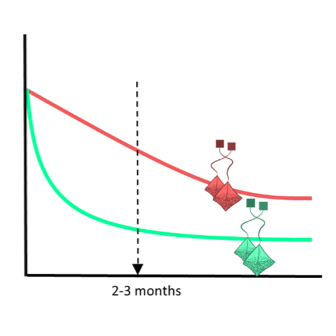 Rooibos tea decomposes much slower (red line) and after three months, it is still in the first phase of decomposition, from which the initial decomposition rate (k) can be estimated. Now we are on a mission! The mission is to get as many tea bags buried (and retrieved) as possible. Do you want to join? Don’t hesitate, it’s fun! Just send an email to judith@tbi.org (link sends e-mail). You can join by burying a few bags or many bags (e.g. along side your own experiments), both are very welcome! The project will run this year and next year.